Here is another selection from Ann DeWitt’s and Kevin Week’s Entangled in Freedom, which tells the story of a black Confederate soldier by the name of Isaac. In this scene Isaac and his master, Abraham Green, have just arrived at the camp of the 42nd Regiment Georgia Volunteers. The soldiers in camp are surprised to see a black man, but decide to make him their chaplain after they learn that Isaac has memorized the Bible. But wait, it gets better. This scene takes place as an officer in the 42nd explains to the men why Isaac and Abraham have both been given permission to stay in the officer’s quarters. “Permission to speak Sergeant Major,” said a First Sergeant at the front of the crowd.” I am First Sergeant Russell. This is the war of the Confederate States of America. Only one-tenth of the people in the state own slaves…and for the most part that’s the planters. As for the men in my tent, we don’t own any slaves. Have you read the latest Harper’s Weekly newspaper?” he asked pulling out a torn sheet. The 42nd Regiment Georgia Volunteers Company E cheered. Master Green winked at me and smiled. Sergeant Major Hart asked, “What’s your point? “Did I also hear that a regiment of black rebels took 500 Union soldiers to a Confederate prison? Yes, a truly remarkable and disturbing excerpt. Notice that DeWitt and Weeks offer their own explanation as to how black men ended up as enlisted soldiers in the Confederate army. First, local courthouses were clearly formally enlisting them all over the South without any knowledge on the part of the Confederate government. More importantly, they can always point out that lack of any racial identification on the enlistment papers if asked to provide evidence for the presence of black soldiers. It’s pretty clear to me after reading the first 50 pages of this book that DeWitt and Weeks are interested in using this story and their limited understanding of the broader history of this subject to foster reconciliation between the races. If it can be shown that the most divisive period in America’s racial past included a great deal of interracial cooperation than perhaps we can do so today. Reconciliation and understanding between the races is certainly a worthy goal, but you can’t get there by distorting the past and that is all they are doing in this book. Very telling that Isaac is bound to Abraham. I wonder if God will tell the father to sacrifice the son? And if there are any rams tangled in thickets in the vicinity of the 42nd Georgia that he could employ as a substitute? The point of writing a fantasy novel is they can avoid actual history. They can make up any fact or build any strawman they want. It’s directed at children, whom they presume won’t have enough education to contradict it. And we can see from the this excerpt, the real point is to rehabilitate the Confederacy, not tell the story of a black person. The only question in my mind is: Are they believers? Or cynics? My favorite part is the first sergeant saying “Only one-tenth of our people own slaves” or whatever. Yeah, I’m sure that was common knowledge among the average confederate soldier. But more importantly, it is reflection of their overly simplistic understanding of the role of slavery and race in antebellum Georgia. Non-slaveowners were intimately connected to the preservation of slavery and white supremacy in numerous ways. Joseph Glatthaar’s “General Lee’s Army” book does a great job of discussing soldiers’ connection with slavery. I believe he states that 5 out of every 9 men who joined the ANV from 61-62 lived in a household with slaves. Yes, it is a must read. Is the Harpers Weekly available online? To paraphrase, the Joker, from The Dark Knight: Why So Historically Inaccurate? I must say that when I first read, of Sargent Russell, reciting the Harpers Weekly’s story, about five hundred Black Confederates mounted on horseback, at the First Battle of Bull Run, and a regiment of Black Confederate soldiers, leading five-hundred Union soldiers, as prisoners of war, I could not stop laughing. Laughing not only, at sheer nonsense and fantasy, of this pure fictional Harpers Weekly’s story, but I cannot fathom, at the sheer audacity and outright dishonesty about the history of the first major battle of the war. Do the authors really expect that readers, some of whom, do not have a deep knowledge of the Civil War, will accept that somehow, one of the most documented and reported events, in United States history, from not only Northern and Southern reporters but also from European reporters, could have miss documenting and reporting this factoid until they found it? My only answer is that the authors assume that readers will accept this nonsense and fantasy. This passage, in the novel, reminds me of comic books that I read when I was a kid. In fact, from my perspective, this novel is a comic book, therefore, I expect that Superman, Batman, Wonder Wonder, or Spider-Man, to show up somewhere, before Mr. Levin finish (if he wants to finish) this comic book novel. So I ask, the Joker’s question again: Why So Historically Inaccurate? Remember, this is a children’s book. They will accept this story and its broader narrative without question. Mr. Levin, I stand corrected. Your’re right, it is a children book, or rather, a historical fantasy book written for children, who will accept its historically inaccurate narrative, without question. Comparing this to a Superman or Batman comic book is kind of an insult to comic books. Well, at least the 10% of true humanitarians and visionaries who rescued them from the auction block. Anyway, keep up the good work. I wouldn’t even know where to start on something like this. I’m looking forward to the scene where, having memorized the Bible, Issac gives Cleburne a lecture on certain passages in the Book of Leviticus. Yeah, that was an extraordinarily cheap shot. Next, they’ll write about ol’ Jim Crow and how the Northerners got that all wrong, too. Don’t let this book get near any children! Geez, is Harper’s reliable, or is it not? Also: Entangled In Freedom? I’m sure everyone else has given up trying to decode this title, but I’m up at night, tossing and turning, trying to figure it out! I can only assume that Isaac’s victory will come when he can finally get untangled from this pesky “freedom” nonsense and go back to liberating servility. Hey, there’s the title for the Reconstruction Era sequel: Liberated In Servility! This goes beyond alternative “history” to dangerously misleading blatant misrepresentation of the historical record.. I think an important book to read is Frederic Bancroft’s classic work “Slave-Trading in the Old South” to understand the nature and extent of the economic role that slavery played in the South. It wasn’t just the families of slave owners (going by titular ownership leaves them out of the %). It included people who furnished goods and services including legal and banking services to both the slave owners and the slave traders. Furthermore, there was a massive industry in leasing slave labor. It was a way of (1) providing income for family members of slaveowners. It wasn’t unusual for a will to leave slaves to women and/or minor children for the precise purpose of leasing them out and providing a regular income for the woman and/or children; (2) it enabled small slaveowners whose primary use of slaves was for agricultural work to not only get additional income from the slaves but to temporarily transfer the expense of the upkeep of the slave(s) to another during slack times, and (3) especially in the 1850s, when slave prices skyrocketed, it provided whites who could not afford to purchase a slave outright, a foothold in the slaveowning elite. As more than one scholar has demonstrated, the slaveowning South was a slave society, with the patriarchal master/slave relationship the foundation of the society. One of the reasons that some, particularly in the Deep South, vehemently argued for the re-legalization of the African slave trade was that prices were getting so high that many non-slave owning whites could no longer believe that they and/or their children could ever hope to aspire to the slave-owning caste. Reopening the African trade would push prices down and also have more manageable non-Westernized slaves. As James Hammond made clear in the Mudsill section of his infamous King Cotton speech, the key to planter control of the non-slaveholding white, particularly the poorer ones, was to put blacks and keep blacks in a subordinate caste below even the poorest white, whose skin color was his badge of status and bond with richer whites. Another thing that the book omits was that, in many slave states, it was illegal to teach slaves to read. Black preachers were particularly suspect because of their broader contact with slaves and their knowledge of inconvenient (for whites) portions of the Bible like the Book of Exodus. One who had actually memorized the entire Bible would be particularly suspect. Also, most of the South was very Protestant. Familiarity with the Bible was not exactly unusual. The good news about this horrible book is that because of this blog, if you Google the book’s title, this article is sixth in the list of results. I suppose then we should be using the name of the book, Entangled In Freedom, as much as possible in these comments. Because Entangled In Freedom is an insult to everything people in both the South and the North fought and died for. And you can quote me on the back jacket of the book Entangled In Freedom. Part of the Street Life Series. Youth Edition. By Ann DeWitt’s and Kevin Weeks. Entangled In Freedom. Instead of “Entangled in Freedom” why not call it “Freedom is Slavery” and have done with it. 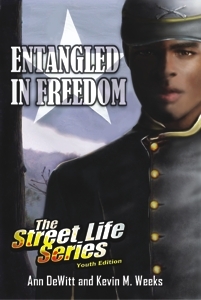 Instead of “Entangled in Freedom,” because that title, “Entangled in Freedom” isn’t a good title. Good to see this series climbing up the Google ranks–and the author protesting that climb! I hope in the end you will write a review of the entire book, title the post something like “A Review of Entangled in Freedom” and put that up. I think it would quickly establish itself as the first hit for the book and would perform an important public service. I am now using what is called the Genesis theme, which allows for fairly extensive SEO controls. This simply means that I can title the post whatever I want, but take care of search ranking concerns behind the scenes.